Hooray! The oven in my new rental house is pretty darn good. It gets to temperature quite fast and it’s blessedly accurate! I’m not noticing any obvious hot spots either which is a bonus when baking. 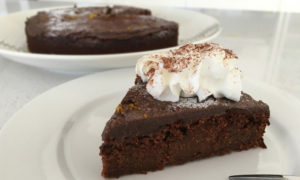 Although this year has delivered another scorching summer here in Perth, I’ve enjoyed baking a few things again as the this kitchen has air conditioning :) I can’t wait to make some low fat, low sugar slices soon. 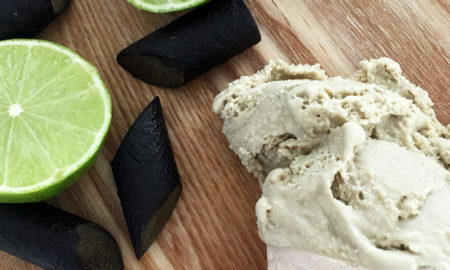 Lemon and coconut is definitely on the radar! For the moment, I’ve been getting back into baking bread. I’ve eased off on the gluten free diet a bit and now include wheat flour bread here and there. I can’t say I’m displeased with this decision as you can’t beat a crunchy loaf or a buttery croissant sometimes. Of course the keyword here is ‘sometimes’ and I still do a meal or two without gluten during the day. Since I’ve been in the baking mood, it was a good time to try something new. 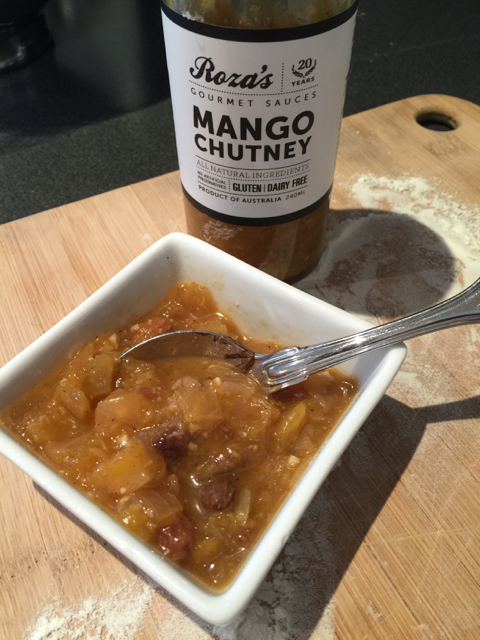 I was recently invited to try a few lovely chutneys from Roza’s Gourmet Sauces, of which one was a Mango Chutney. I’ve tried many mango chutneys before (especially Indian style ones to go with curries), but I liked that Roza’s version contained coconut and macadamia nuts. A bit of an Aussie twist! It was fruity, crunchy, spicy in all the right measure. Although mango chutney is a common condiment to have with a serve of Butter Chicken, I think it’s a wonderful match with cheeses and can easily replace quince paste as a fruity accompaniment to anything from Brie to a sharp, tasty cheddar. That in mind, I decided to pair the two up for a very special cob loaf. 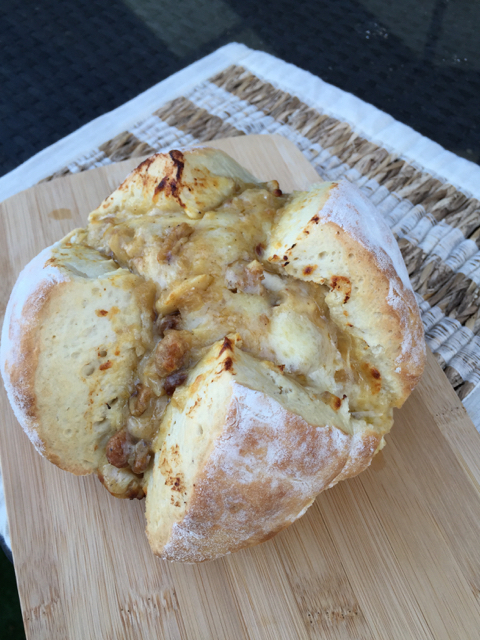 You may be familiar with the party favourite of scooping out the centre of a round loaf of bread and filling it with a dip, usually eaten with chunks of the scooped out bread. I wondered however, if it might be fun to just bake the bread with a filling already inside. I made up a dough for a standard crusty loaf of bread and prepared a special filling of Roza’s Mango Chutney combined with a crumbly cheddar. I also added some extra nuts to tie the mixture together. This is pretty easy to do with a Thermomix or food processor but the cheese doesn’t have to be made into a paste so combining by hand is fine too (a bit of chopping and stirring). 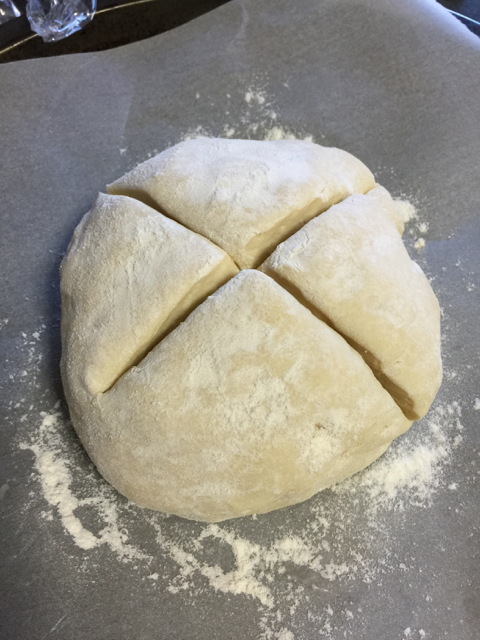 I baked the bread as usual with a typical cross in the centre of the cob in preparation for filling. Once it was close to being ready, I removed the loaf from the oven and placed the filling into the gaps made by the cross. I put the loaf back into the oven for another 5 minutes until the cheesy mixture was melted through. Bread needs be rested for a while before serving but once it’s not too hot to the touch, it’s ready to be brought out to your guests. The loaf can be pulled apart or sliced up. Guests should be invited to grab a knife and pile on more filling onto their slice or chunk. 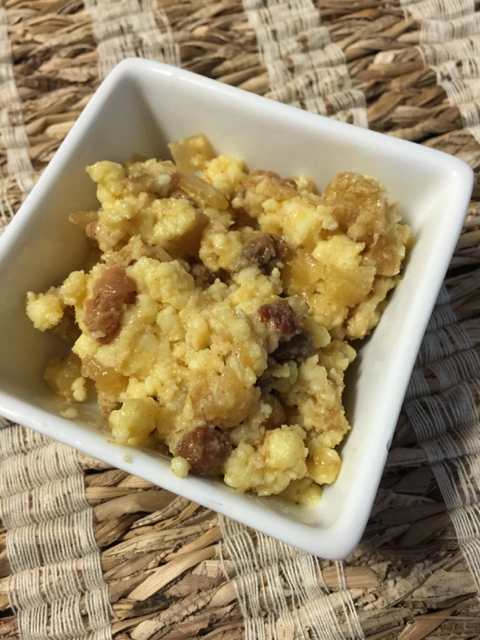 The cheesy filling has the spicy tang of the chutney as well as delicious bits of nuts and fruit. I tried this also with Camembert for something different but I think cheddar works best. If you’re not too confident with baking, you can also buy a cob loaf and slice a cross into the centre and fill it as per the recipe and place it into a hot oven when you’re getting close to wanting to serve it. Combine all these ingredients in a bowl and set aside in fridge. 1. 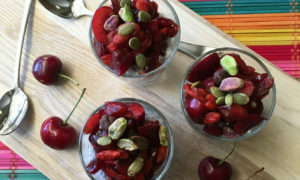 Combine all dry ingredients into stand mixer bowl or Thermomix bowl. Add water and egg to dry ingredients and knead according to the machine you are using. If you are a seasoned baker and prefer doing everything by hand then I need no explanation I’m sure! I you only have hands to work with, then I recommend reading up on preparing bread dough by hand. 2. Once dough has formed (it should come together into a ball and feel elastic) place in a lightly oiled bowl and cover with plastic wrap. Leave in a warm place for at least one hour. If you are not ready to bake then you can put the risen dough in the fridge until ready but you will need to let is come to room temperature again before baking. 3. When dough has risen, place on a floured surface and knead for a minute. Return dough to bowl and cover again if doing a second rise. After second rise, knead again for another minute. 4. Form dough into a ball and place on a floured baking tray. Cover with a damp cloth and let dough rise again for 20 minutes. Pre-heat oven during this time to 220C (200C fan forced). When oven is ready, dust top of load with extra flour then slice a cross into the cob with a sharp knife. Place loaf into oven and bake for 25 minutes. 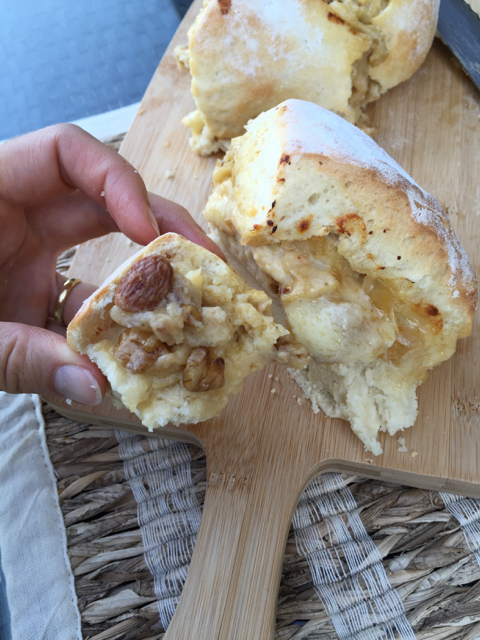 Once loaf is golden and makes a hollow sound when tapped, remove from oven and quickly stuff loaf with filling. Place loaf back into oven for another 5 minutes or until cheese filling is melted through. Remove from oven and allow to rest on a rack for 10 minutes until cool enough to handle. Note: Mango Chutney was provided to the blogger courtesy of Roza’s Gourmet Sauces. wow..so good to see someone trying Indian Style Chutney.I will be following you now.